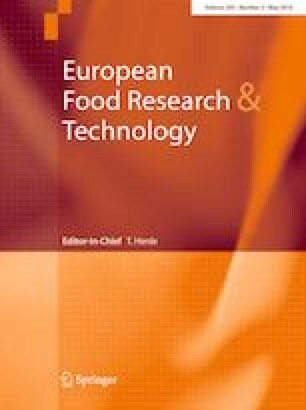 This study investigates the effect of harvesting altitude, fermentation time and roasting degree on the volatile profile released by coffee (Coffea arabica, variety Catimor) powder. The analysis of the volatile organic compounds was performed by proton transfer reaction mass spectrometer (PTR-MS). The experimental design consisted of three factors: altitude at two levels (900 m and 1500 m, milder and harsher climate, respectively), four different fermentation times (0, 24, 48 and 72 h) and roasting at three levels (light, medium and dark). Analysis of the released volatile organic compounds (VOCs) revealed that the intensity of m/z 45 and 59 dramatically decreases at a higher harvesting altitude. Longer fermentation times induce a decrease of m/z 61 and 75, probably related to the activity of the isocitrate lyase. Finally, a prolonged roasting degree induces a rise of the m/z 61, 75, 81 and 97. The total count per second measured by PTR-MS was used as an index of “overall coffee aroma intensity” to build a linear regression model. The model was used to predict the total VOCs intensity on the basis of the altitude, fermentation time and roasting level. The validation of the model (adjusted R2 = 0.91 and normalized relative standard deviation in prediction of 7%) reveals that, although the degree of roasting clearly affects the resulting aroma intensity, altitude and fermentation time also play a role in the formation of the volatile profile. Moreover, a significant interaction was observed between the altitude where the bean were grown and the roasting level. These results support the hypothesis that the type of process of the seeds has a strong impact on the resulting coffee’s quality. Furthermore, PTR-MS coupled with linear regression models is a powerful tool for the quality control of coffee process. Prapaijit Kruathongsri was supported by The Thailand Research Fund (TRF), in the project Research and Researcher for Industry (RRI) “Development of Arabica coffee bean containing gamma-aminobutyric acid (GABA) and its application for ready-to-drink coffee beverage”. The partner industry is WaweeCoffee Co., Ltd., Chiang Mai, Thailand. We are grateful to the Province of Bolzano for financial support (Landesregierung mittels Beschluss Nr. 1472, 07.10.2013).